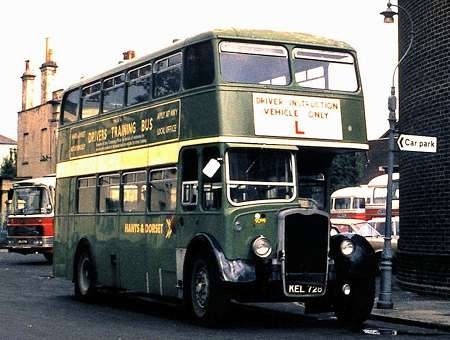 SRU 981 was new to Hants & Dorset in 1956 as their 1368. It is a Bristol LD6 with ECW body H60R seating when new. The Bristol engine was replaced by a Gardner in 1961, making it a Bristol LD6G and doors were fitted in that year. 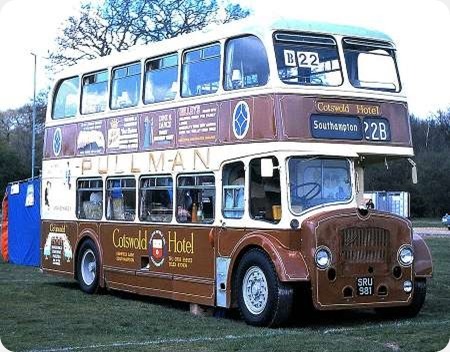 In the first view, on Southampton Common on 6 May 1979, it has been sold to the Cotswold Hotel as a mobile dining facility. The occasion is the Southampton City Transport Centenary rally. In this second view, taken on 2 April 1995, it is in the Southampton Citybus yard in Portswood, in the livery of Hants & Dorset Trim. It was with the ‘new’ Crosville, in Weston Super Mare when the 2012 PSVC list was compiled. Would I be right in thinking that SRU981 would have been one of the first Lodekkas with the squarer front grille as opposed to the deeper front panel on earlier models? Also I notice in the lower picture that Lucas combination tail lights have been fitted. Originally I think that model had a stop/tail bulb on the inside of the body behind the reflectors. This meant that the stop lights were virtually impossible to see in sunny weather, and after a short while when the bulbs & inside of the reflectors got dusty, making them impossible to see in just about any conditions. I think originally indicators were fitted on the sides at the front only (like Southampton Corporation for a while) but later round Lucas indicators were fitted above the reflectors. Saved a lot of money in rear corner panel repairs by doing that! 7678 LJ is a Bristol FS6B with ECW H60RD bodywork, new to Hants & Dorset as 1478 in 1962. Under the 1971 renumbering, she became 1137. As we see, she has the offside illuminated advert panel and is in the NBC poppy red livery. She’s at Barton Park, Eastleigh in August 1976. This is where the waters become decidedly murky. The PSVC listing for this fleet (PK782) does not record her as having been painted thus, though it does mention some of her sisters, and it does not tell us when she was withdrawn. She looks to have been newly repainted in this view, but is among several withdrawn ones in W&D red, H&D green and NBC red. Any comments, folks? Withdrawn in 1976 according to Peter Gould website. 7678 LJ was repainted into NBC red livery in June 1975, withdrawn in August 1976, and sold to Martin (dealer) at Middlewich the following month. It had had the air suspension (at the rear) replaced by coil springs in September 1968. I don’t have information on any subsequent owners, however. Between 1965-69 I worked as a fitter at West Yorkshire Road Car, York Depot. The air bags at the rear usually one would loose air and the flex beam that supported it would break, the other air bag could compensate for awhile. On replacing said components it had to be reset with the levelling valve by removing alloy plates near the rear seats. Also the Lodekka had upstairs heater radiators, getting the air out of the water system took sometime if the heads etc had been off. Best fitting job I had. Thank you, Graham and Peter. I’m forced to ask, if she was withdrawn in 1976 – as my photograph suggests – then why bother with the repaint? It’s like British Railways in the Beeching era – the line closes in three weeks, so let’s put down some new ballast! ………or RAF stations, Pete D. If they started tarting one up, you knew it was doomed within the year! Been to Mildenhall recently, then, Chris H? The Pentagon have announced its closure within two or three years. The units there don’t want to move [to Germany] and the locals are hoping a Republican gets in at the next election. I think I can answer this one; As a local enthusiast at the time, I was making regular visits to Poole depot where this vehicle was based. 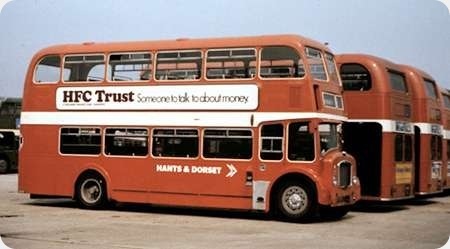 I clearly recall this bus as it was in fact the first ‘later-style’ FS to be taken out of service, and this was because it suffered major engine failure and being fitted with a BVW unit, was withdrawn prematurely rather than being repaired (there were I believe, still some late LD’s in service at the time). Hope this is helpful! Thank you, Geoff. That explains everything! The picture of 1478 stirred a long-forgotten memory for me – and I’m hoping it may be something you bus detectives might be able to clear up! 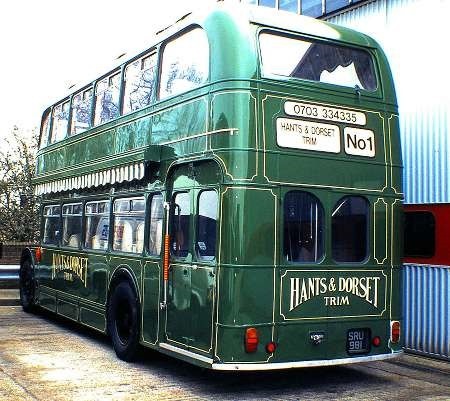 During a visit to my grandparents at Lee-on-Solent sometime in the mid to late sixties, I remember boarding a very similar bus (still happily in Tilling green at the time), and noticing it had an opening push-out top vent to the nearside outwardly curved window at the rear (i.e. the one on the back nearest to the platform doors). I have never seen this on any other Lodekka. 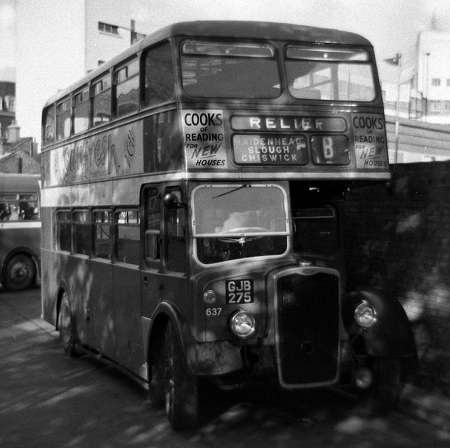 The bus was most definitely an FS and it had cream window rubbers, so it would have been post 1961-62. As I was a keen enthusiast in those days, I seem to recall the registration was of the four number/two letter arrangement. It could actually be this very bus, or at least one of the same batch. Can anyone shed any light on this unique Lodekka? I can recall the vehicle you mention; in fact somewhere I have a photo of it, but would mean a lot of digging to find it I’m afraid! It was certainly a Southampton based FS and did have a ‘push out’ type vent (normally fitted to the front bulkhead windscreen) in the top of the rear emergency door glass. It was probably done as some kind of long forgotten experiment!